Our pre-sale coverage of Sotheby's-NY Library of an English Bibliophile Sale Part II, October 20, 2011 concludes with a look at four great books with great big estimates. 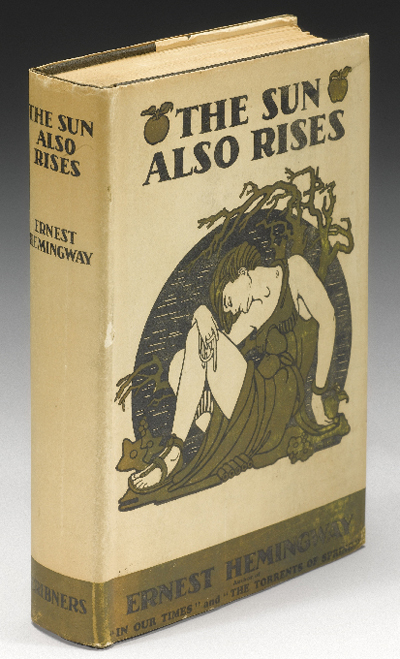 The Campbell-White copy of Hemingway's The Sun Also Rises has returned to Sotheby's auction block where it last sold on June 7, 2007, lot 106, for $99.000. It's a beautiful first edition, first issue ("stopped" on p. 181, line 26, misspelled as "stoppped) in the rare and un-restored first issue dust jacket ("In Our Time" misprinted as "In Our Times). The estimate for this go-round is $70,000 - $90,000. 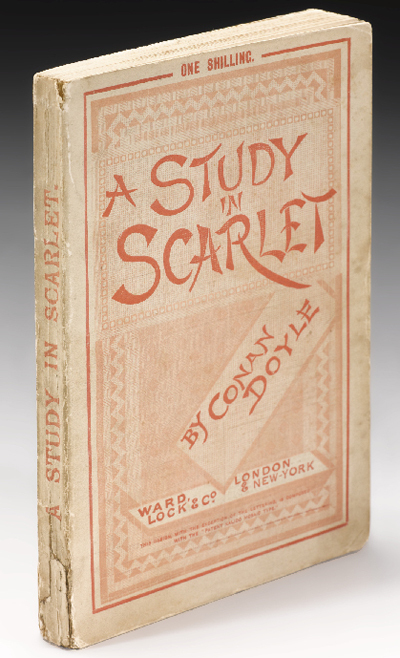 It's no mystery why a copy of the first separate edition (originally appearing in Beeton's Christmas Annual for 1887) of Arthur Conan Doyle's A Study in Scarlet (1888), which introduced Sherlock Holmes, is estimated to sell for $60,000 - $80,000. Though a second impression (with "younger" misspelled as "youger" in paragraph two, line three of the Preface), it's in the original flimsy wrappers and possesses the called-for ads at rear. Scarce thus, it is usually seen rebound or the wrappers an unmitigated wreck. The last time this copy came to auction was in 1981, when it sold for $15,000. 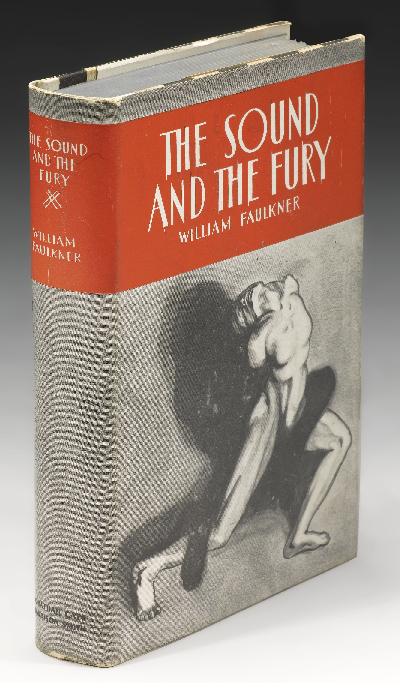 The last time the Jordan copy, fine in fine dust jacket, of William Faulkner's The Sound and the Fury was seen at auction was at Sotheby's-NY, June 18, 2004 as lot 295, where it sold for $55,000. It is now estimated to sell for $50,000 - $70,000. 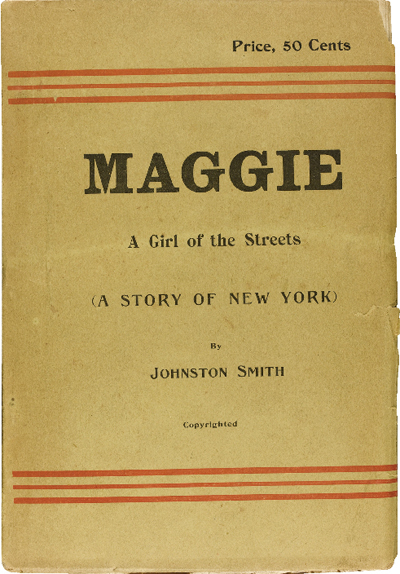 If you're Stephen Crane and you self-publish your novel, Maggie A Girl of the Streets (A Story of New York), in 1893 under a pseudonym in a first edition of 1,100 and sell only two - two! - copies through Brentano's, it will give you great posthumous nakhes to learn that it is estimated to sell for $15,000 - $25,000, not that it will do your bank account any good. Rejected by all publishers he submitted it to and poison to retailers because of its frank subject matter, this, the fine, unopened Estelle Doheny copy, is one of only approximately thirty-five known to have survived. It last sold at Christie's-NY, October 17, 1988, as lot 1220, for $9,500.